I was on a boat. But, it started long before that. Each year, a college roommate plans a trip to a nearby lake. Open water. Sunshine. Laughter. Burgers. Beer. Lots of beer. These are the basic ingredients for any great summer weekend. But, this doesn’t just come together overnight. Even when I party, I like to plan ahead. All this effort went into a booze-fueled day that I can barely remember. Much like our fantasy drafts. While I can just sleep away my mistakes on the boat, I can’t rid myself of draft day mistakes nearly as easy. They linger. They taunt you every time you look at your roster. If I put this much effort just to add more excitement to my drinking, it is important to be equally prepared on draft day. Lack of planning can leave you stranded. Mock drafts can offer the life jacket you need leading up to your draft. If you love themes that are stretched way beyond the point of being funny or really bad puns, then you’re “shore” to find this mock draft summary helpful. 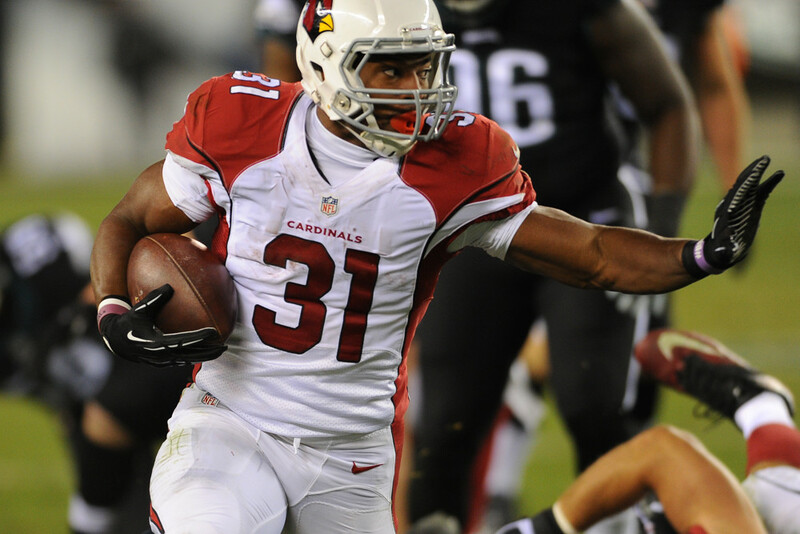 We examine trends and strategies for 12-team, PPR drafts and how they impact your draft day decisions. Waiting on a quarterback is en vogue. It is one of the most commonly used strategies in 2017. Passing on quarterback early allows you to maximize your roster. For example, Aaron Rodgers is currently going at the end of the second round. You could select Rodgers and then take Pierre Garcon in the seventh round. Or, you could choose to grab Brandin Cooks with the same second round pick and then make Derek Carr or Kirk Cousins your quarterback. Similarly, a roster of Russell Wilson and Dalvin Cook looks much more appealing than Tom Brady and Doug Martin. Taking this philosophy to the extreme, you could decide to be the very last to draft a quarterback. This approach, in a 12-team league, would give you a choice between Philip Rivers, Matthew Stafford or Dak Prescott in the tenth round or even later. This gives you the best chance of stockpiling quality rushers and wideouts. Similar to quarterbacks, most owners have been patient when targeting tight ends. Yet, noticeable tiers have developed at this position. Understanding how tight ends are being drafted may help you lure in the one you want. The way tight ends are being drafted resembles a stair step pattern. Only two tight ends (Rob Gronkowski and Travis Kelce) are being taken in the first four rounds. Then, another “step” exists in the fifth round, where a position run sees three more (Greg Olsen, Jordan Reed and Jimmy Graham) going off the board. Finally, the last “step” begins in the ninth round, where upside plays like Hunter Henry, Eric Ebron, Austin Hooper and Cameron Brate are still available. What does this mean for fantasy football owners? Ideally, you would either get one of the two elite tight ends or just continue to wait. However, if you do have a specific mid-range option in mind, plan to take them a round earlier than their ADP. This ensures you get your desired tight end target. It wasn’t long ago that fantasy analysts advocated skipping over running backs in the first round. That trend has been thrown overboard. Let’s dust off the scrapbook and take a stroll down memory lane. In 2013, running backs reigned. Eleven of the first 12 and 15 of the first 20 picks that year were rushers. Since then, with each passing year, fewer running backs have managed to stay in the first couple of rounds. 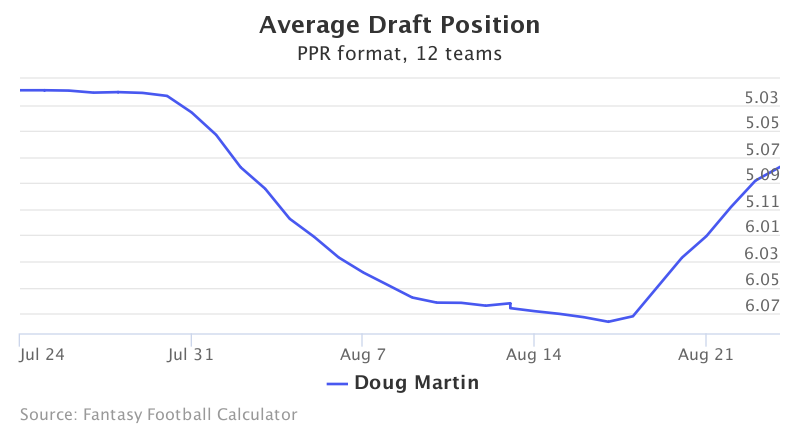 Then, the draft stock of fantasy running backs hit rock bottom. 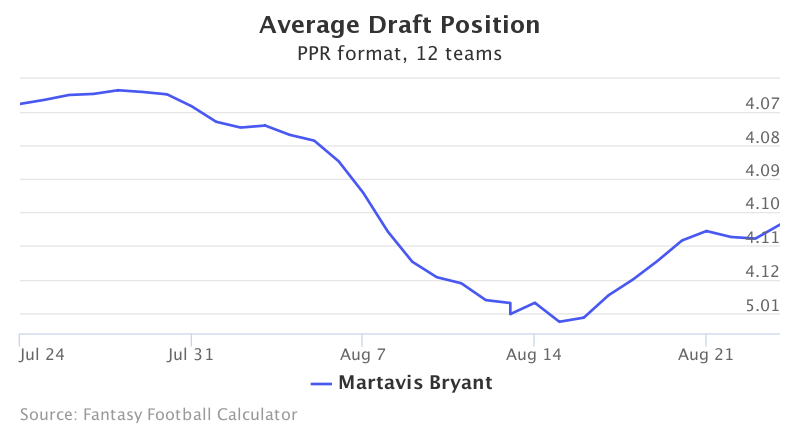 The movement of shying away from this position early in drafts reached an all-time low. Only four running backs were taken in the first round last season: David Johnson, Todd Gurley, Ezekiel Elliott and Lamar Miller. The pendulum has now officially swung back the other way. According to the most recent mock drafts, potentially half of all picks in the first two rounds are expected to be running backs. Johnson or LeVeon Bell are definitely the prize jewels, but there are several other choices in the next tier. Hook yourself a running back early or risk being left without one. New England: The team brought in three new faces to compete for the starting job. As if that isn’t confusing enough, you never know from week to week who will get the majority of the carries in the Patriots’ offense. Good luck trying to figure it out. Kansas City: Spencer Ware (4.12) hasn’t done anything to lose his grip on the starting job. Yet, he did fizzle down the stretch last season. His highest rushing total from Week 8 on was only 69 yards. Despite a run-friendly offense, Ware managed only three touchdowns in 2016. Any slip could open the door for rookie Kareem Hunt (8.07). Baltimore: The mock drafts are puzzling when it comes to the Ravens. Despite being projected to score nearly identical totals, Danny Woodhead (4.08) is going almost four rounds before Terrence West (8.02). Woodhead does benefit greatly in PPR leagues, but injuries remain a concern. New Orleans: Despite being the most talked about off-season acquisition, Adrian Peterson (6.06) has done little to surpass Mark Ingram (5.12) in reality or fantasy. Ingram has finished as a top-15 fantasy rusher in three consecutive seasons. Expect rookie Alvin Kamara (13.12) to handle the work on passing downs. This makes him an interesting, late round PPR play. Detroit: The Lions’ two featured backs have been drafted near each other in virtually all drafts. Coming off a season-ending injury, Ameer Abdullah (5.09) is expected to return to form and lead-back duties. Theo Riddick (7.05) is a fringe no. 2 running back who may go unnoticed due to a wrist injury that has limited him so far. Seattle: In a backfield riddled with injury, Eddie Lacy (8.06) has become the starter by default. Yet, he hasn’t been able to pull away from the pack. This has vaulted Thomas Rawls (9.03), whose ADP has risen almost a full round over the last month. Second-year player C.J. Prosise (9.08) may be the most interesting. His value has fallen nearly an entire round in 10 days, as owners have panicked to a groin injury. This may be an overreaction since a MRI revealed no damage. This makes him even more of a sleeper candidate. Every off-season seems to be a constant news cycle of arrests, investigations, suspensions and holdouts. While these have serious ramifications for real-life NFL team, they have yet to have very little impact for fantasy owners. Four key contributors have either been suspended or are still awaiting punishment. Ezekiel Elliott: To say that the 2016 rushing leader has been in hot water this off-season is an understatement. An investigation into domestic violation allegations resulted in a six-game suspension for the Cowboys rusher. 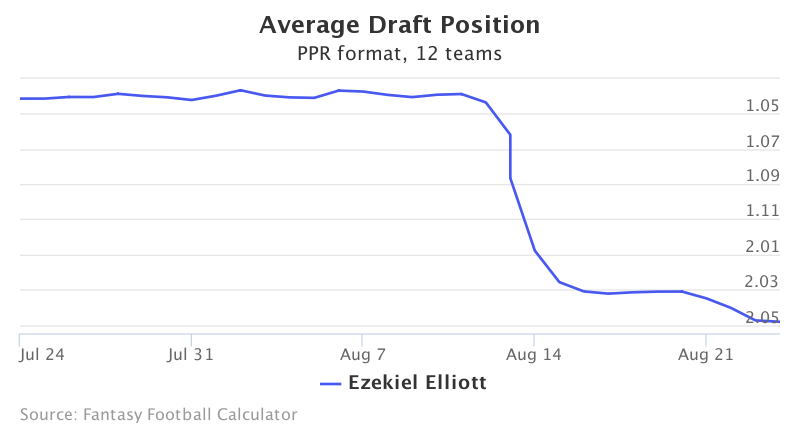 Before the suspension, Elliott was a near-lock for the first round. Although he has filed an appeal, his ADP dropped a full round since the punishment was announced. Owners wishing to draft Elliott will still have to invest early and be comfortable waiting until his Week 8 return. Doug Martin: Fortunately, owners have had plenty of time to prepare for Martin’s suspension. Stemming from a positive test for PEDs last year, Martin will face a four-game suspension to begin the season. A strong pre-season has allowed the Muscle Hamster to creep back up draft boards. However, there is some concern that he may never fully get his starting spot back. Martavis Bryant: Some uncertainty still surrounds Martavis Bryant’s status. Suspended all of 2016 for multiple violations of the league’s substance abuse policy, the Pittsburgh wideout has been allowed to participate in training camp and pre-season games. But, he hasn’t technically been ruled eligible yet. Owners are still drafting him in the fourth round, banking on a breakout performance as a no. 2 option. 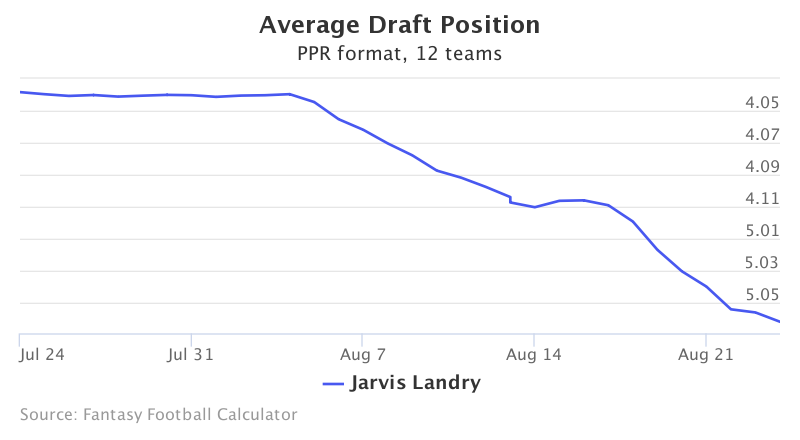 Jarvis Landry: The most recent subject of investigation, Jarvis Landry has seen his ADP bottom out over the last several weeks. While police have determined there is no cause for arrest, that doesn’t mean anything just yet. Elliott wasn’t charged and still received a suspension. Landry may face a similar fate. As running backs have re-emerged, wide receivers have sunk further down in recent years. But, that doesn’t mean they are any less valuable. Elite wideouts still dominate the draft board, featuring 11 in just the first two rounds. There are several mainstays that remain at the top, like Antonio Brown, Julio Jones, Odell Beckham Jr. and A.J. Green. After the trade of Cooks to New England, Michael Thomas has also rocketed into the early second round. The real action, however, is taking place later. While these fantasy studs garner most of the attention, almost every round in the latest mock drafts has at least half of the picks made up of wide receivers. Runs have developed in many rounds at this position as well, where draft participants will gobble up wide receivers in consecutive picks. Savvy owners must understand how this may influence their own drafts. Because focus has shifted to elite running backs early, owners are snagging multiple wide receivers later hoping to hit on at least one. Target pass catchers who dominate targets and be prepared to take them earlier than anticipated. A very simple theme is taking shape: Wait as long as possible on every position outside of running backs and wide receivers. This is perhaps most important for D/STs and kickers. If you draft one of these earlier than the last two rounds, you are literally wasting draft capital. This is harsh but a necessary lesson. This goes beyond a mere pet peeve. Statistics back this up more than most owners are willing to admit. In the past 15 seasons, only two units have finished as the top-ranked defense after being drafted first, second, third or fourth. That’s two out of 60 picks. Need more proof? The chart to the right compares 2016’s ADP with their finish at the end of the year. Five D/STs that were drafted in the top 12 last season actually fell below the 18th-best spot by the year’s end. Conversely, three D/ST units were not even drafted but still finished in the top 12. In case you missed the fundamental point, let’s make it clear again: Do not draft a D/ST or kicker before the very end of the draft. Stream both positions, picking up useable pieces when needed throughout the year. Don't drown in a sea of information. With all the different fantasy opinions and analysis available, draft preparation can quickly pull you under. Often the simplest solution is the best. Reviewing mock drafts, like our study above, reflect common trends and strategies in real time. While every league is different, this data can reveal who you should target and when. For this reason, mock drafts are the easiest and most effective way to prepare.